Researchers conveyed findings on the trade-offs of policies that emphasize the supply and demand sides of water allocation and use, as well as those that promote adaptation and consider consumer behaviors. Research-based ideas were presented for how to manage the application of new technologies to adapt to long-term and persistent drought. The speakers presented on the collaboration of Land-Grant Universities and United States Department of Agriculture (USDA) through various programs, forecasting, and monitoring efforts. The opening remarks were given by Robert Johansson, USDA Chief Economist. Speakers were Steven Wallander, Economist at the USDA Economic Research Service, and Ariel Dinar, Resource Economist, University of California, Riverside. You may see a webinar presentation of Ariel Dinar’s and Steven Wallander’s presentations here. For a full list of FFAR Council members, please see here. Congratulations to all of the agricultural and applied economists who were named to the FFAR Councils! The Tenth Annual World Food Prize will take place MONDAY, OCTOBER 10, 2016 at The Downtown Des Moines Marriott Hotel from 9:00 am to 4:00pm. Agricultural economist, Jan Low will be honored for her work on the on the sweet potatoes. As The International Potato Center’s Regional Leader for Africa, Jan recognized the potential of OFSP to combat Vitamin A deficiency among young children in Sub-Saharan Africa. To establish an evidence base that nutritionists could rely on, she conducted a major study among poor African communities in 2005—with support from USAID, the Micronutrient Initiative, and the Rockefeller Foundation—demonstrating that consumption of orange fleshed sweet potato (OFSP) led to a 15 percent decline in Vitamin A deficiency in children who consumed a daily portion of OFSP compared to children who did not. Armed with that knowledge, she led a seminal study under a HarvestPlus “Reaching End Users” project that was concerned with how to effectively deliver OFSP to poor and vulnerable households. This study firmly established that it was possible to cost-effectively scale up using the pioneering integrated agriculture-nutrition-marketing approach. 2016 Iowa Hunger Summit: Register Today! The Iowa Hunger Summit is a grassroots event, organized by the World Food Prize, free and open to the public, which gathers Iowa citizens fighting hunger for a day of workshops, keynote speakers and a Hunger Luncheon, where guests sample meals used by organizations in hunger-fighting efforts at home and abroad. Register Now! The workshop will provide an opportunity for engagement in the development of the bio-economy. The workshop plans to encourage and advance the efficient use of renewable aquatic and terrestrial biomass resources and stimulate the production and manufacture of renewable bioenergy and plant-based products. Read more here. The Priorities and Solutions Project seeks your input on the draft content of the project report. We continue to seek your feedback on the draft. Although the content should reflect the conversations at the workshop, the audience for the final documents is broad. The main audience here is not peers in our profession, but rather, external stakeholders, policy makers, and agencies. We seek your input as to how to make these priority areas appealing to many different contacts across government and partners. We want to make sure they are inspiring and engaging. Much progress has been made, but there is still more work to be done. Your input is important. Input is due by Tuesday, September 6. The full draft Priorities and Solutions document can be found here. A survey monkey for input on the Priorities and Solutions draft can be completed here. Thank you to those who attended the Priorities and Solutions Project Update at the AAEA Annual Meeting. Please see the YouTube Videos linked below to view the presentations at the event. As part of the agricultural and applied economic priorities and solutions project, we are going to host webinars to encourage greater engagement in the ideas presented at the workshop. Please consider attending to hear more about these innovative and forward-thinking ideas! All webinars were recorded and are available on the C-FARE YouTube Channel. Thank you also to all of you who participated in the Big Data Pre-conference. The links to those presentations will be included in the early September update. If you want to receive a copy of a specific presentation, please contact Chariese Walton at cwalton@cfare.org. Sources of funding, expertise, distribution, credibility, and visibility—strategics matter to emerging companies. In this webinar series, we'll look at 43 strategies: their targets, timelines, projects and partners. ERS releases farm income statement and balance sheet estimates and forecasts three times a year, in February, August and November. These core statistical indicators provide guidance to policy makers, lenders, commodity organizations, farmers, and others interested in the financial status of the farm economy. ERS's farm income statistics also inform the computation of agriculture's contribution to the gross domestic product of the U.S. economy. During this webinar, we will provide the August forecast for 2016, as well as first estimates for 2015. Dr. Richard Ready of Montana State University will give a presentation on how agricultural best management practices aimed at reducing nutrient and sediment loads play an important role in restoring ecosystem function in the Chesapeake Bay. The Federal Trade Commission (FTC) and the U.S. Department of Agriculture (USDA) will co-host a public roundtable in Washington, DC on October 20, 2016, to discuss consumers’ interpretations of certain “organic” claims. The roundtable will help the agencies better understand how consumers perceive “organic” claims for non-agricultural products, such as personal care products. August 12, 2016: The U.S. Department of Agriculture’s (USDA) National Institute of Food and Agriculture (NIFA) announced the availability of $3.1 million to train the next generation of agricultural leaders. This funding is available through the Food and Agricultural Sciences National Needs Graduate and Postgraduate Fellowship Grants Program (NNF). Read more here. August 12, 2016: Choices Magazine – Off-farm Income: Managing Risk in Young and Beginning Farmer Households. It is well documented that farm households over the past several decades have increasingly relied on off-farm income sources and, primarily, off-farm employment. This trend of increasing off-farm labor participation rates and income is particularly important to those entering agriculture; i.e. young and new farmers. Much of the contemporary focus on young and new entrants to agriculture has been on the growth of various direct-to-consumer marketing channels. However, the continuance of traditional production agriculture relies on developing the next generation of farmers as well. Read more here. August 11, 2016: National Institute of Food and Agriculture 2015 Annual Report. This report highlights the amazing work undertaken in 2015 by our grantees in the areas of research, education, and extension. The successes we underscore in this report are the result of our strong collaboration with land-grant universities, non-land grant universities, farmers and livestock producers across the country, small businesses, other federal agencies, our USDA sister agencies, public and private organizations and associations, and our growing list of international partners. Read more here. August 5, 2016: COSSA Hot Topic – “Reducing the Regulatory Burden on Federally Funded Researchers.” Over the past several years, the scientific community and policymakers alike have become increasingly concerned about the amount of time and resources scientists must devote to administrative tasks in order to apply for and comply with the terms of federal research grants. In its report, “Optimizing the Nation’s Investment in Academic Research,” the National Academies of Sciences, Engineering, and Medicine argues that such regulatory and administrative requirements “are diminishing the effectiveness of the nation’s research investment.” In fact, a 2012 Federal Demonstration Partnership survey of investigators found that principal investigators of federally funded research projects spend, on average, 42 percent of their time on associated administrative tasks. Read more here. July 25, 2016: Agriculture Secretary Tom Vilsack announced that the U.S. Department of Agriculture (USDA) is seeking applications for funding to help support the development of advanced biofuels, renewable chemicals, and biobased products. The program now provides loan guarantees of up to $250 million to develop, construct and retrofit commercial-scale biorefineries and to develop renewable chemicals and biobased product manufacturing facilities. Read more here. July 20, 2016: S.1252, the Global Food Security Act of 2016 ,was signed by President Obama. Agricultural Secretary Tom Vilsack stated that, “Agriculture's vital role in our economic success and national security is a bond that we share with other nations all over the world. With agricultural development as a core component of his strategy, President Obama's Feed the Future initiative has achieved impressive results in combating poverty and hunger, reaching millions of small farmers with tools and technologies, and delivering critical nutrition to millions of children. In effect, Feed the Future represents the best of our American values—compassion, innovation, collaboration, and progress toward a world free of hunger and inequality.” Read more here. July 14, 2016: The White House Rural Council (WHRC) announced a workshop series to provide targeted assistance for rural small businesses working to grow demand through international sales. The free series includes at least 60 Made in Rural America small business export workshops hosted by the U.S. Postal Service (USPS) in 24 states July 26 to August 31, 2016. Partners including the U.S. Department of Commerce's International Trade Administration, USDA Rural Business Service, the Appalachian Regional Commission, Delta Regional Authority, National Association of Counties and others will also provide local and regional expertise in international shipping and mailing, international marketing assistance, rural business development and related topics. Online tools designed for rural businesses interested in international exports include www.export.gov, and www.business.usa.gov. Read more here. June 23, 2016: The U.S. Departments of Agriculture (USDA) and Interior announced more than $47 million in investments to help water districts and producers on private working lands better conserve water resources. Through the WaterSMART Grants, Reclamation provides 50/50 cost-share funding to irrigation and water districts, tribes, states and other entities with water or power delivery authority. Projects should seek to conserve and use water more efficiently, increase the use of renewable energy, protect endangered species, or facilitate water markets. Read more here. Also read about drought response here. This priority research area encourages the development of theories, methods and applications of economics. It encourages applications in the following broad areas: agricultural market structure and performance; international trade; agricultural production and resource use; consumer behavior; farm labor and immigration and policy; agricultural policy design and impacts; technology development and adoption; and science and innovation policy. Funding: Standard Grants, Strengthening Standard Grants, and New Investigator Grants must not exceed $500,000 total per project (including indirect costs) for project periods of up to four years. This Program Area Priority examines the interrelationship of natural resources and the environment with agriculture and rural communities. Research projects funded through this priority will advance economic theories, methods, tools, analyses and applications that contribute to understanding an ecological approach to agriculture (including forestry and aquaculture) embracing production and sustainable resource management simultaneously. This Program Area Priority focuses on the development and/or adoption of new models to assist agricultural (farm, forest, or ranch) landowner/manager decision making with respect to appropriate scale management strategies and technologies to enhance economic efficiency and sustainability, including the viability and competitiveness of small- and medium-sized dairy, poultry, livestock, crop, forestry, and other operations. 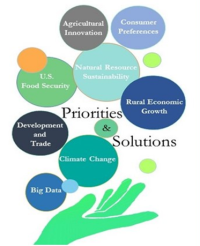 This Program Area Priority is designed to support rigorous conceptual and theoretical research and extension activities to develop and apply new knowledge to advance economic opportunity and improve the well-being of people involved in agriculture, food systems and rural communities. Projects may evaluate the institutional, sociological, or economic factors affecting decision making and the adoption of private strategies and public policy options to enhance the well-being and resilience of agricultural and food businesses and rural communities. Projects may also explore strategies to promote community and regional innovation in youth entrepreneurship, develop the workforce, and address community and human capital challenges, poverty and income inequality in rural areas. This program focuses mainly on entrepreneurs and small businesses (2–99 employees) who are important sources of employment, and/or on other issues “beyond the farm gate." NIFA requests applications for the AFRI Agriculture and Natural Resources Science for Climate Variability and Change (AFRI ANRCVC) Challenge Area Program for fiscal year (FY) 2016 to support research to facilitate the adaptation of agroecosystems and natural resource systems to climate variability and the implementation of mitigation strategies in those systems. For FY2016, the AFRI Agriculture and Natural Resources Science for Climate and Variability Challenge Area (AFRI ANRCVC) encourages proposals that address the patterns, processes, and consequences (including GHG emissions and other climate feedbacks) of changes in land use and their drivers, particularly considering intensive farming and forestry systems at multiple spatial and temporal scales, studies that examine the social and behavioral aspects of adoption of adaptive measures and best management practice in the context of changing weather patterns and climate, to ultimately support sustainable and resilient agricultural landscapes into the future. Funding: Coordinated Agricultural Project (CAP) Grants must not exceed $1 million per year (including indirect costs) for project periods of up to four years. For FY2016, the AFRI ANRCVC encourages proposals that will bring together a team of extension professionals, along with educators, researchers, non-profits, businesses, policymakers, and other stakeholders, to design an innovative approach to conducting community-based educational outreach for better understanding of climate, extreme weather events, energy, conservation, preparedness by people and community leaders, and the impact of informed decision-making. The long-term goal of the program is to support communities and build their capacity to independently plan, initiate, and carry out programs that address these issues. Funding: Standard Grants must not exceed $250,000 per year (including indirect costs) for project periods of up to one year. In the Agriculture and Food Research Initiative Sustainable Bioenergy and Bioproducts (SBEBP) Challenge Area, specific program areas are designed to achieve the long-term outcome of reducing the national dependence on foreign oil through the development and production of regionally appropriate sustainable bioenergy systems that materially deliver advanced liquid transportation biofuels, biopower, and bioproducts.